With only partly cloudy sky forecast in Cleveland, tonight will be a chance to observe the Lyrids meteor shower. Since it is hard to see all but the brightest meteors when the moon is out, the best time will be after the moon sets at 3:15 a.m. From then until the sun starts to rise, you will have your best chance of seeing the activity. If you miss them tonight, your next opportunity will be when the Eta Aquarids are scheduled on the night of May 5. 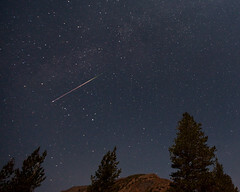 For further dates and times, see http://stardate.org/nightsky/meteors. Of course, photographers are not simply satisfied with watching the display. They are going to want to grab some photos to prove they were up at that ungodly hour. So, how do you shoot a meteor as it shoots across the night sky? Preferably a wide angle lense - wider than 55 mm if possible. If your camera has a setting for long exposure noise reduction - turn it on. Affix your camera to a tripod, or securely balance it on a bean bag, aiming high toward the eastern sky. To start, set your camera to EI400. Open your lense as wide as possible. Start with exposure times from 10 to 30 seconds. With a remote release, or your camera's timer, try a couple shots. Taking your camera from the tripod, zoom in all the way to analyze your picture in the LCD. The ideal shot will have a dark black sky without looking light grey. Adjust your exposure time and/or EI setting to reach the darkest sky possible. You'll want to keep the shutter open as long as possible to increase your chances of catching the meteors, but not so long as to "fog" the background. Experiment changing the EI rating from 100 to 1000, and try f-stops one or two less than wide open. Framing your photos with some trees, rocks or hills gives it some perspective and makes for a more interesting shot. Otherwise, all you will have will be a black photo with some dots and streaks. Doug Bardwell, based in Cleveland, OH, writes about interesting new travel and photography topics across the country and around the world. Feel free to drop him a line at travel.dougbardwell@gmail.com with suggestions for future stories. To get his stories delivered to your inbox, click the RSS feed. Forget the staycation - how about a Thrillcation?